There has been a request for more photos, so this afternoon when Joe and I were having a late lunch on the balcony of the canteen on the 10th floor of Building C, we looked down at the neighborhood to the east of us and decided to take a walk there. 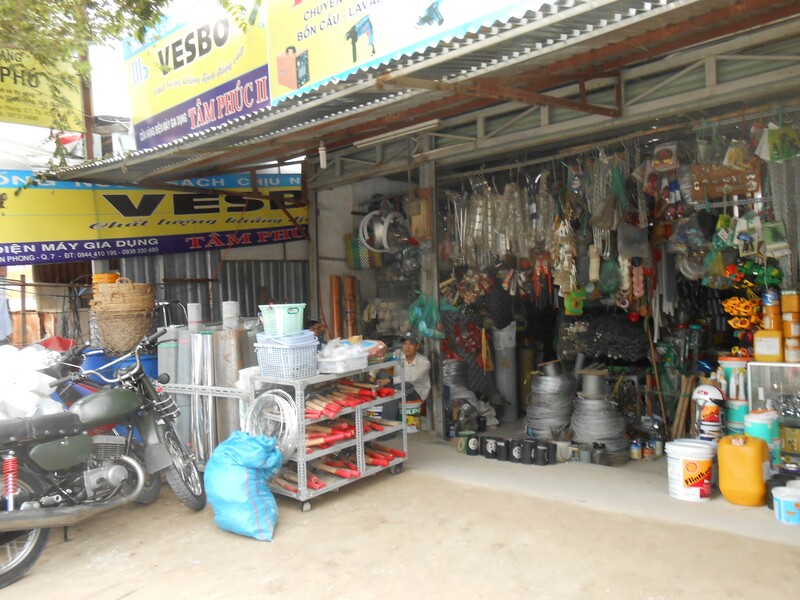 The street that we would follow is called Le Van Luong. This for some reason does not show the hundreds of motorbikes that were really there. But never mind. See the little shops lined up on the other side of the street? 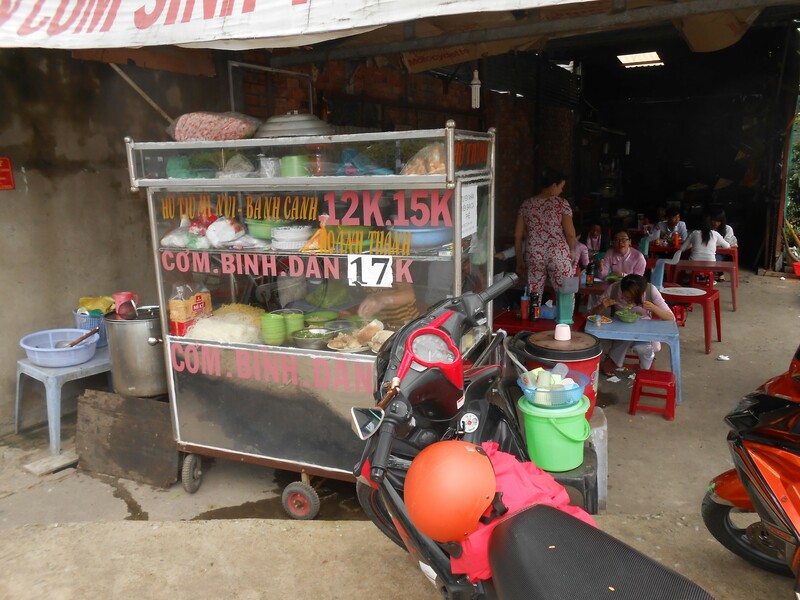 Those are mostly little cafes, selling different kinds of food that they cook right there on the sidewalk. 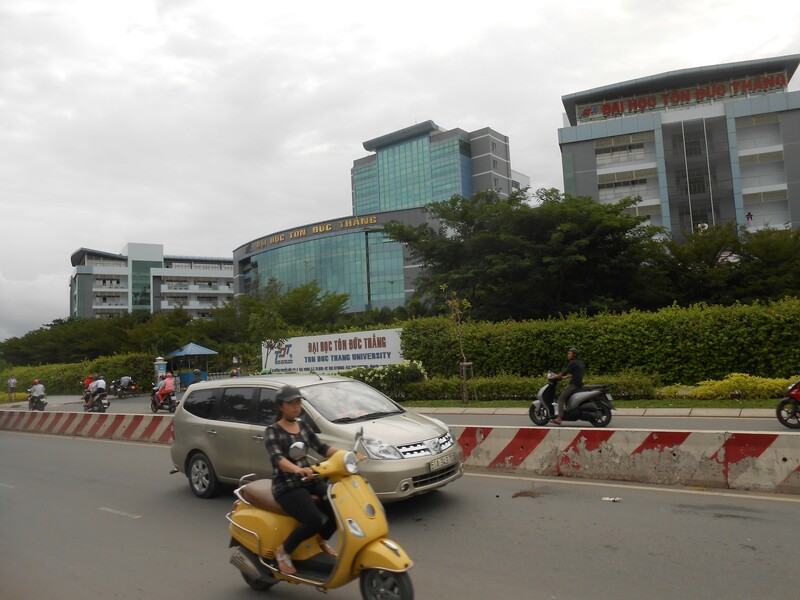 Here is what’s on the other side of the same street: Ton Duc Thang, modern high-rise technical university. 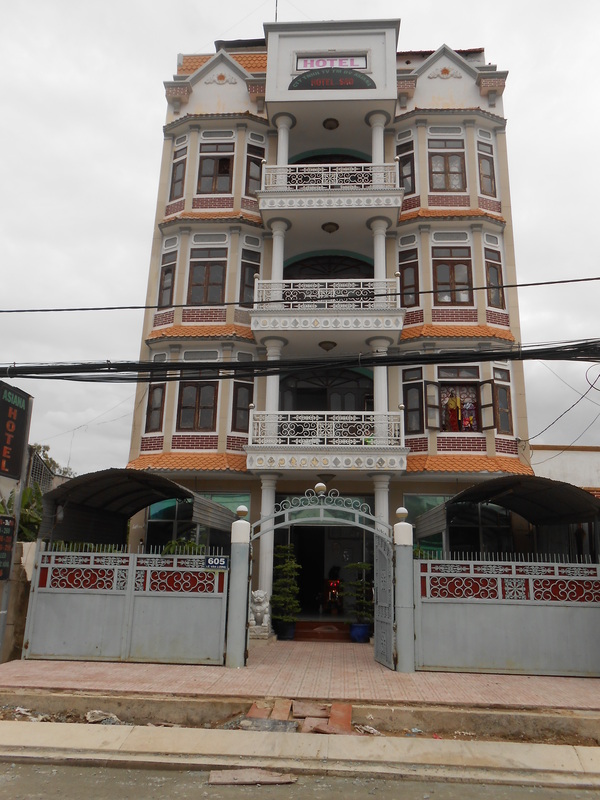 So we started walking south along this big street, Nguyen Huu Tho. We passed cafes with students in them, and some of them waved to us — it was hard to see exactly who they were, but they seemed to recognize us. To say we are conspicuous is putting it mildly. I have decided to think of ourselves as giraffes. That would explain the way kids gape at us. The young people in white in the back are students. Next to that cafe there was a small cockfight going on. 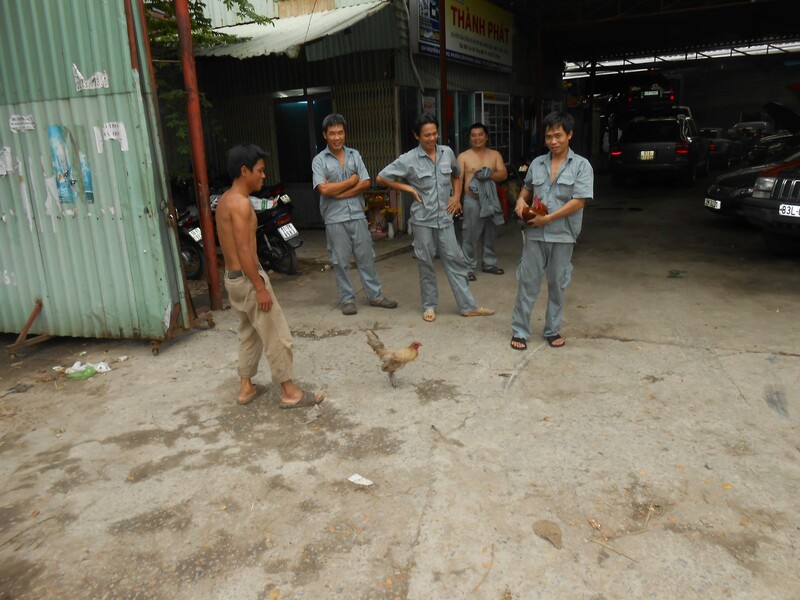 There are chickens all over the place, including in the dorm canteen which is one the ground floor and open air, and I assumed they were being helpful with bugs and crumbs, but here were two roosters that provided entertainment. The fight did not seem serious. The white rooster was allowed to run away. We came to the corner and turned left up Le Van Luong. This street is really one lane, with most of the traffic going all in one direction. Right now, it’s crushed gravel. They are building a new sidewalk on the east side, plus new gutters on both sides of the street. It almost looks as if the street itself is being elevated. One result of that is that in front of many of the shops, people have big piles of dirt that they are shoveling into their houses to raise the floors, which are dirt underneath whatever surface they’ve put on top. At this point the day had been fairly clear, with no rain, but it was five pm and if you looked to the south you could see a black cloud coming. The people who had big dirt piles in front of their places were shoveling hastily. I saw a woman with a pearl necklace shoveling. In this picture you can see the new gutter, with a small pile of dirt, on the west side of the street, and in the right hand side of the picture you can see the new sidewalk. This is really a major upgrade of this street. My guess is that this is an old neighborhood that is only now getting sidewalks and paving for the first time. There are narrow alleys that run into this street that look like real neighborhoods. 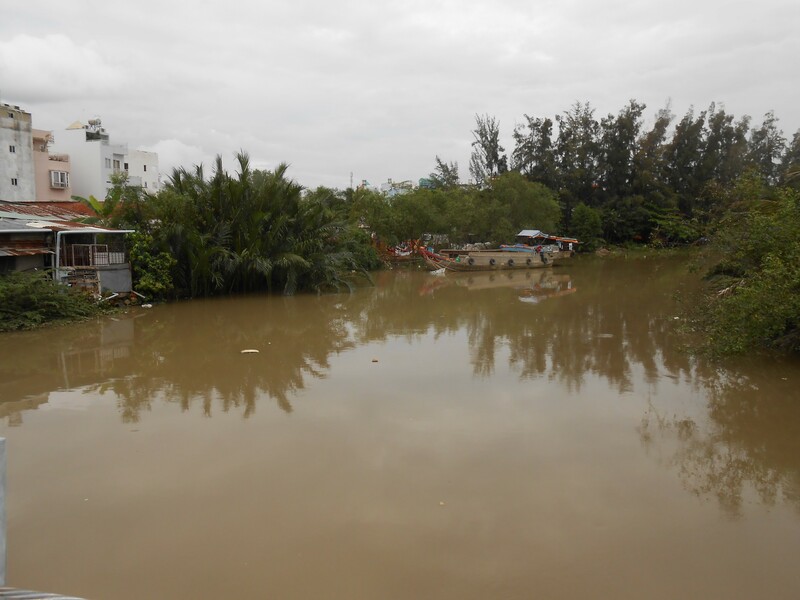 One long block away,the big boulevard Nguyen Huu Tho might have been an urban development project through what looks on the map like wetlands. 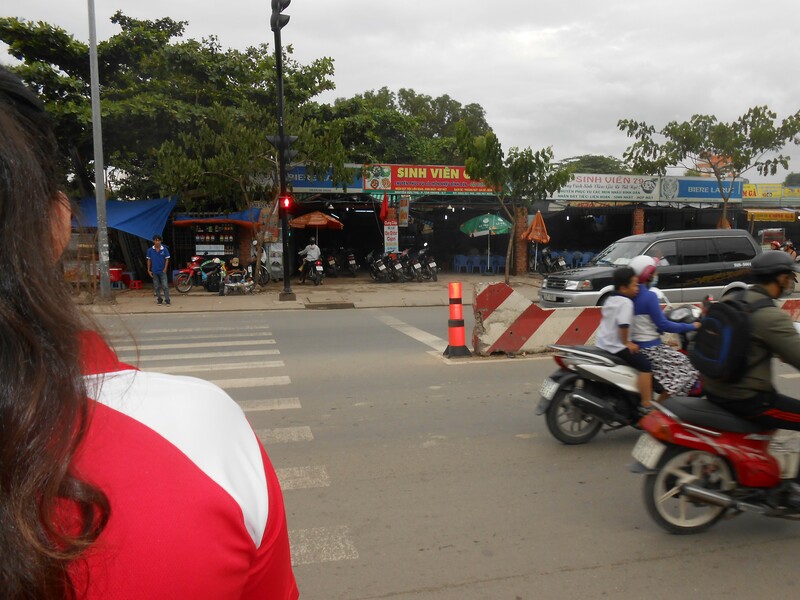 Le Van Luong street is full of cafes. 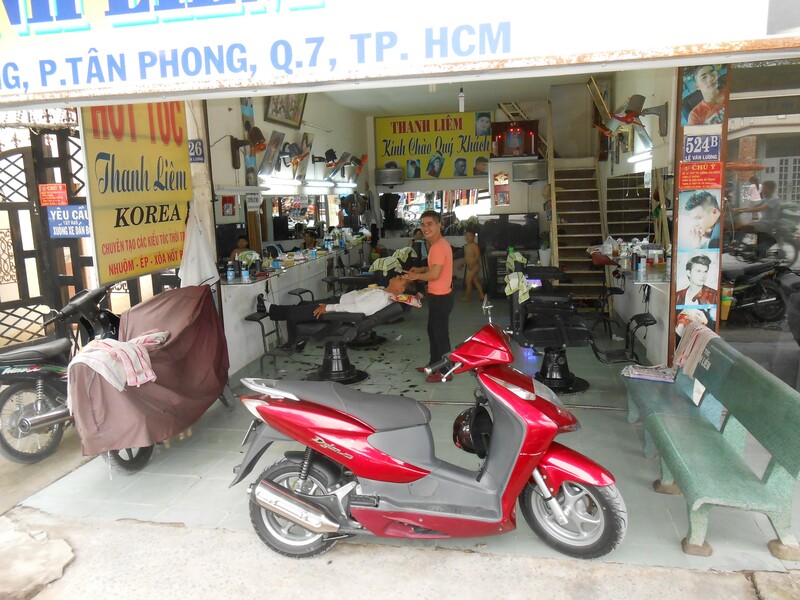 If there is one motorcycle repair shop, one construction materials shop, then there are two coffee houses and two restaurants, with a laundry, a taxi dispatch office and a hotel in between. 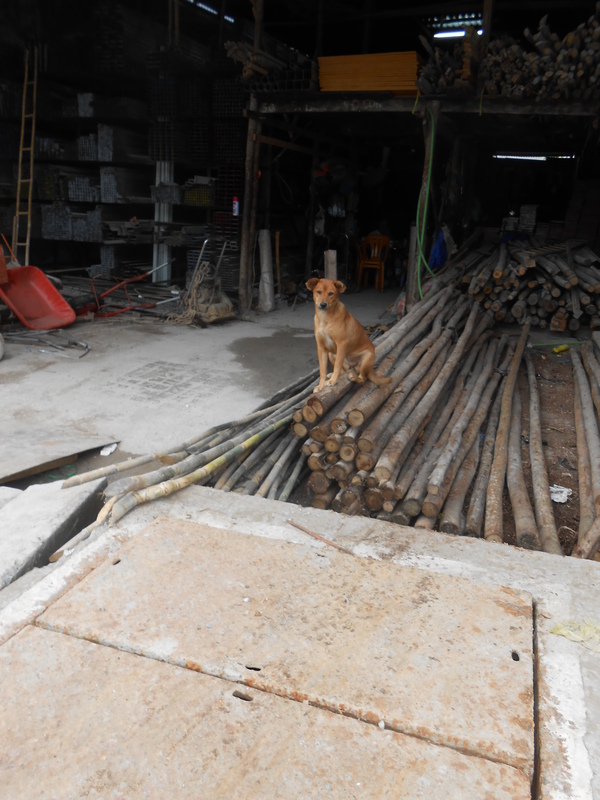 Here is a little yellow dog sitting on a pile of wooden poles in a construction materials shop. Saigonese dogs are all this same yellow short-haired mixed breed type. They are not the kind of dog you go up to and pat, although they may come towards you, sniff and then walk away. The guard at the gate near our room has a dog like this. In shops they are mostly sitting on piles of stuff. 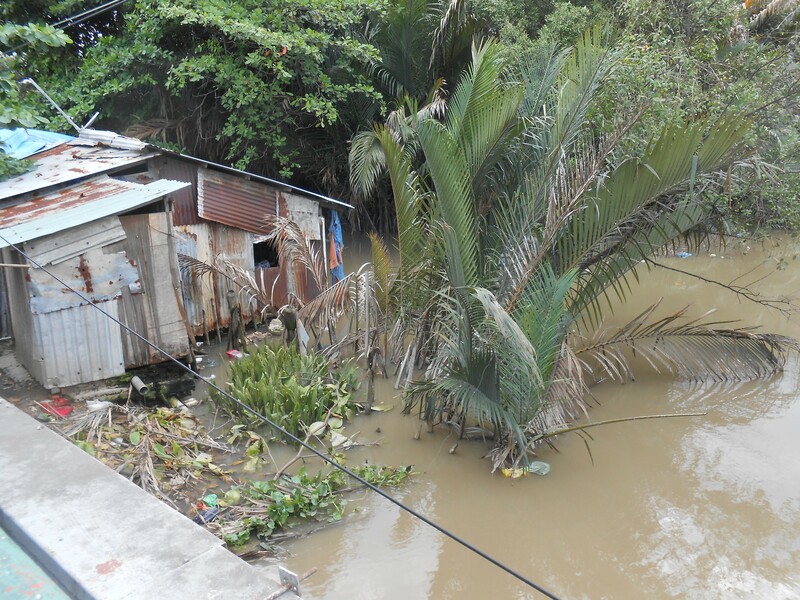 The poles in this picture are a basic construction item used for holding up roofs or constructing dams. The canal on campus is dammed up with poles like these, driven vertically into the muddy bottom and then banked with mud and sandbags. Judging from what’s hanging in the windows, this hotel looks as if people were renting rooms there for months or years at a time. They also advertise rooms by the hour, 18 hours and 24 hours. And on the left is a barber shop where Joe will probably get his hair cut soon. We decided not to do it right at that moment. the barber was using a straight razor and it didn’t look as if hurrying him with that other customer would be a good idea. Here are two eating establishments. I asked permission to take these pictures, by the way. 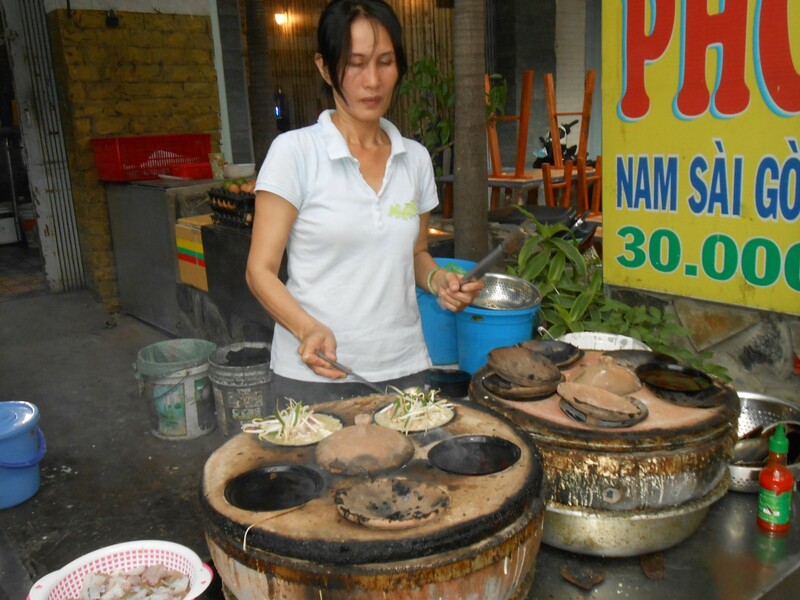 The woman on the left is cooking over charcoal in little hot clay plates. First she puts oil, then some maybe living seafood creature, and then some batter which bubbles up, and then she adds greens and veggies. I don’t know what happens next. 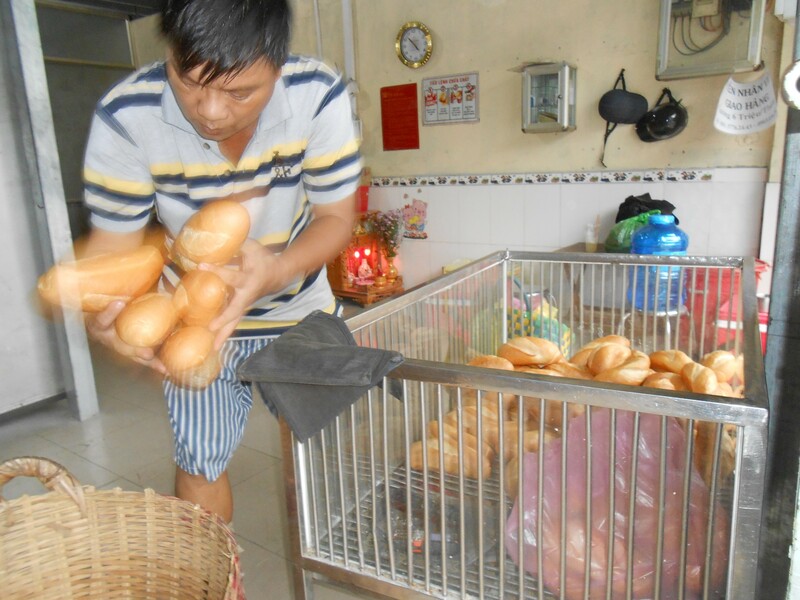 And a bakery, where wonderful rolls were coming out of the oven and this guy was piling them into a basket as fast as he could. The sky was getting darker and people seemed to be focusing on getting things done, delivering things to where they were supposed to be. Soon after this, a young man waved to us across the street and came over. It was one of my students, out having a coffee with his brother after class. This really made me stop and consider what it meant to be walking down a strange street in a strange country and be recognized by a student from one of my classes. This happened in Berkeley quite a lot when I was teaching at Peralta, and I loved it. It happened quite a lot in Chicago, too. But that was almost 9 years ago, and it’s been a while. A little father up we came to a bridge. 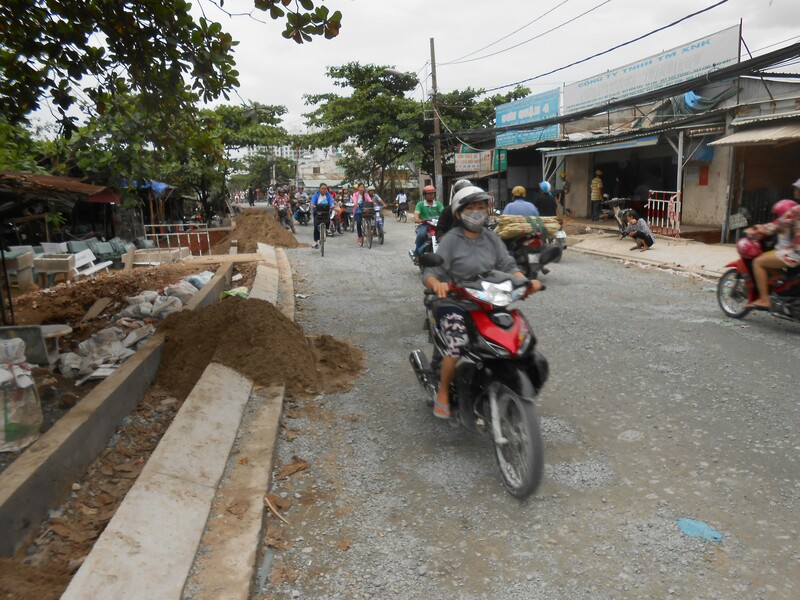 On the map, the bridge appears to cross over the Rach Thay Tieu, but this whole area is threaded with rivers so it’s hard to tell. The metal building half in the water on the right is the downhill side of a cafe that looks perfectly nice on the uphill side. The picture on the left shows a boat in the distance that has a dragon eye painted on the prow. You can click on these pictures to enlarge them, by the way. At this point, it started to really rain. We put on our rain gear and so did almost everyone else, motor scooters pulling over while drivers got out their plastic. People working the street cafes started setting up their umbrellas. Some people just decided to get wet. We turned left onto Hguyen Thi Thap, stopped at the Lotte Mart and went to the bookstore where we found a copy of the memoir of Madame Binh, Nguyen Thi Binh, who was the foreign minister of the Provisional Revolutionary Government and head of the delegation to the Paris Peace Talks. There is a picture of Merle Ratner in it, showing her as a young woman with Madame Binh. Published in English in 2015 by Tri Thuc Publishing House, same date for the Vietnamese version. You’re filling in many blanks in our understanding of Vietnam and SE Asia. I’m really enjoying your writing, and I’ve learned how to write replies to your articles. And, yes, include pictures, please. 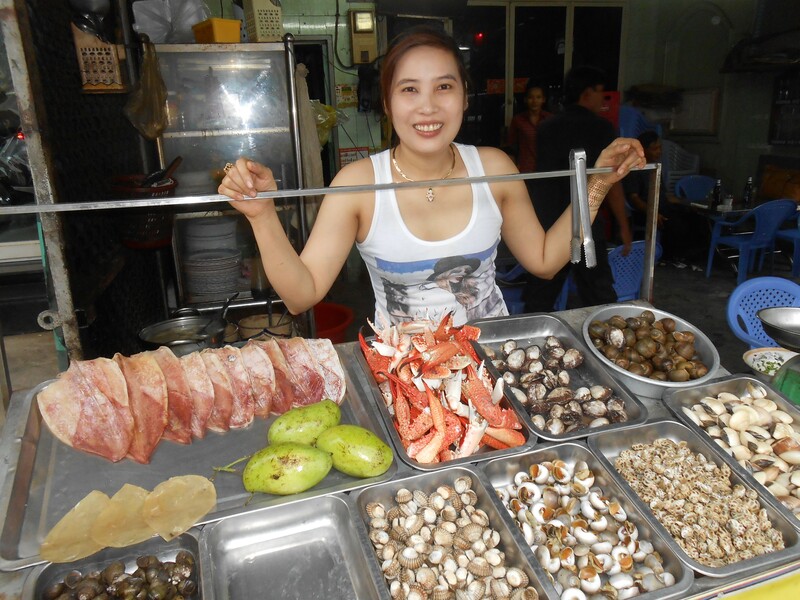 When we were in Saigon, we stayed across the street from the big central market in downtown. Once we walked across the huge traffic circle there, just to see if we could do it. I was terrified but Gerri was amazingly calm. We always head a little bit into the traffic, and, yes, keep moving. RE strikes, maybe all our preparation for a strike is part of the bureaucratization of our labor movement. Being well-organized seems like a no-brainer, but it provides management with enormous amounts of information that enables them to plan effective counter-measures on top of all the help they get from our labor laws. You’ve read Jeremy Brecher’s Strike! I expect. As I recall, he wouldn’t be surprised that wildcat strikes are so effective in Vietnam. Somewhere in the basement, I think I still have a wonderful old pamphlet extolling the virtues of wildcat strikes in the Detroit auto plants in the 50s. I wonder if I can find it.